The first of our four regional BASE events was launched at Carlisle College on Tuesday 25 February 2014. Northern Society of Chartered Accountants (NorSCA) will host 4 out of the ICAEW’s 47 heats of this prestigious national school’s competition which is a fantastic percentage of the total! Northern Society President Jeanette Brown chaired the judges panel of 3 alongside Chris Carr of Armstrong Watson and Tracey Wilson of BPP. A total of 9 teams battled for the top slot which was eventually won by Lime House School from Dalston near Carlisle. They will be one of four Northern representatives at the national final which will be held in Birmingham at the end of June 2014. Jeanette commented “It was a fantastic event. The kids enthusiasm for the competition really shone through. I’m really looking forward to the remaining heats – even though being a judge was slightly more exhausting than I expected!”. 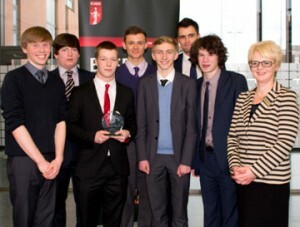 Picture shows Lime House School, winners of the BASE heat in Carlisle with their mentor Joe Abernethy from Saint & Co. and Jeanette Brown, President of Northern Society of Chartered Accountants.